As LBJ delivered his 31 March address announcing his withdrawal from politics and the willingness of the U.S. to open diplomatic talks aimed at ending the war, the situation in South Vietnam remained unclear. Contrary to much allied thinking at the time, the Tet offensive was not a one-shot, go-for-broke gamble by the enemy. It was instead the second phase of an ongoing communist campaign that had been kicked off in the last months of 1967. The tip of the Viet Cong spear had been broken during the Tet attacks, but sizable numbers of guerillas had escaped relatively unscathed. Several NVA divisions remained in South Vietnam while others lurked in their cross-border sanctuaries in Laos and Cambodia. The unprecedented January-February offensive seemed to have run its course, but there would be more to come. While the Tet battles raged elsewhere, Khe Sanh remained the focal point in both Washington and MACV Headquarters. Concern over the fate of the beleaguered outpost generated haze that obscured intelligence indicators of the enemy’s true objectives. Similarities to the siege of Dien Bien Phu, while in reality only superficial, were nonetheless far too obvious to ignore. Fully aware of the stakes involved, LBJ extracted what amounted to a blood oath from the Joint Chiefs. Khe Sanh could, and would, be held. In great secrecy, MACV and CINCPAC staffs were ordered to plan for a worst case scenario in which tactical nuclear weapons would be used to stop the base from being overrun. But the ever alert Washington press corps caught wind of the scheme. Plans for Operation FRACTURE JAW were quietly locked away, their very existence not to be disclosed. 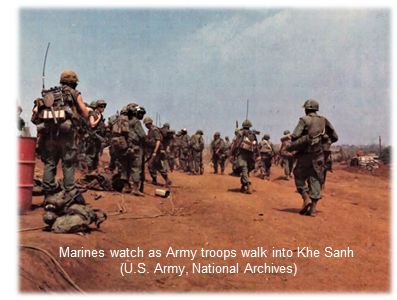 Khe Sanh was relentlessly pounded by virtually every type of high explosive shell and rocket in the communist bloc arsenal, but the much anticipated all-out ground attack never materialized. The ongoing NIAGARA air strikes, along with quick reacting army and marine artillery fire, forced the besiegers to keep their own heads down and decimated those caught in the open. The Marines beat back the handful of probes that momentarily managed to penetrate the outer defensive lines. All the while, the crews of USAF transport aircraft and Marine helicopters braved bad weather and the gauntlet of enemy AAA and small arms fire to keep Khe Sanh's aerial lifeline intact. Meanwhile, the faithful SENTINEL SARA collection birds maintained their vigil over Khe Sanh, intercepting enemy communications that could not be heard on the ground, while EC-47 crews continued to pass ARDF fix data to the Marines below. Among the options considered during the Khe Sanh siege was the utilization of five EC-47s equipped with the specially developed QRC-346 communications jamming suite. In late January, 6994th Security Squadron representatives briefed MACV staff on Electronic Warfare Operations Plan 1-68. The plan called for the jammer birds to operate in mission areas along Route 9 from the Laotian border over to the coast then south to Chu Lai. In preparation, Pleiku was ordered to fly Q-system-trained operators on ARDF missions in these areas so they could become familiar with potential targets. When activated, the QRC-346 system would blank out selected enemy radio communications throughout I Corps and possibly beyond. Enemy command and control would be severely disrupted, but friendly channels would likely be degraded as well and there would of course be a loss of SIGINT. In the end, COMUSMACV ordered the jammers to remain at Tan Son Nhut, in passive mode but ready to go on 24 hours' notice. Intelligence played a decisive role in the defense of Khe Sanh. The results, in the words of an NSA historian, represent "one of the greatest SIGINT success stories ever." ARDF had been key in revealing and identifying surrounding enemy units early on, and that support continued throughout the battle. An estimated 30 percent of all targeting information was based solely on COMINT. At one point, "ARDF located Hanoi's forward command element for the Khe Sanh action, and tactical air strikes virtually obliterated it." Even the much maligned “McNamara Line” sensor fields proved to be a valuable asset. The sensor signals were monitored by orbiting EC-121 BAT CAT aircraft, which then passed the information to the Marines' command bunker for analysis and exploitation. Purely by chance the small Marine SIGINT detachment hunkered down inside Khe Sanh discovered a similar South Vietnamese unit on the edge of the base. The two efforts merged to monitor the voice communications of NVA artillery networks, providing life-saving warnings of enemy fire missions and even ground probes. Whatever the enemy’s plans were for Khe Sanh, by mid-March the situation had changed appreciably. An unknown number of NVA, probably in the thousands, had been blasted to smithereens over the past weeks. Enemy battalions were gradually ordered elsewhere, leaving about 7,000 troops surrounding the American base. With flying weather steadily improving, COMUSMACV gave the go-ahead for Operation PEGASUS, an overland strike that would reopen Route 9 and break the siege. On 1 April two Marine battalions marched westward out of Ca Lu, about 16 miles from Khe Sanh, while overhead the distinctive whump-whump sound of “Huey” helicopters announced the arrival of the 3d Brigade, 1st Cavalry Division (Airmobile). Combat engineers followed on the heels of the grunts, sweeping mines and making badly needed repairs to get the road in shape for vehicular traffic. Initially very little contact was made with the enemy as the Americans moved rapidly west. Meanwhile, patrols from Khe Sanh began to sweep outside the wire for the first time in weeks. The NVA dealt the Marines some hard blows here and there, but overall enemy resistance was spotty. Unexpectedly stiff opposition at an old French fort south of Khe Sanh momentarily checked the 1st Cav’s advance, but when an air assault landed to storm the position from the rear the troopers found that the NVA had fled. The end was more fizzle than grand finale. On 8 April, Army soldiers linked up with bedraggled but stoic Marines inside the combat base. Operation PEGASUS officially ended on 15 April. Looking to cut off the withdrawing enemy and sparked by the knowledge that the area was a major NVA logistical base, U.S. forces entered the A Shau Valley for the first time since being ejected in 1966. Operation DELAWARE featured a series of air assaults, most by the 1st Cav. With a few exceptions, NVA resistance was light—main force troops formerly in the valley were moving towards other locations in preparation for the next phase of the offensive. The month-long operation did uncover large supply caches in what was indeed a large and sophisticated enemy complex. Among the finds were a field hospital, extensive electrical and telephone lines, and a pair of Soviet bulldozers. The Ho Chi Minh “Trail” was rapidly becoming much more than that. As the battle for Khe Sanh wound down, communist leaders conducted their own assessment of the recent offensive and pondered how best to seize the most advantageous position, militarily and politically, if or when peace talks actually materialized. Many of those closest to the action in the south, acutely aware of losses already suffered and mindful of ongoing morale and supply problems, doubted that a renewed round of attacks could be sustained. But Le Duan, now the dominant force in Hanoi’s political hierarchy, pressed for continuation of the general offensive. The result would be something of a compromise. In this second wave, by necessity almost exclusively an NVA show, Saigon would be the only urban area intended for ground attacks, while other main force units attempted to blast open an invasion corridor through eastern I Corps. Other key or diversionary targets would be hit with stand-off mortar and rocket attacks, followed by ground assault if opportunities presented themselves. 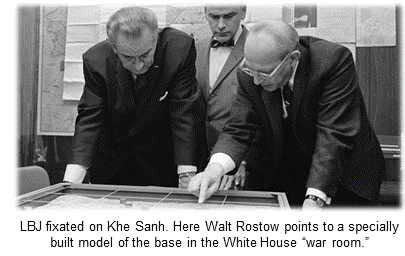 Any notion of a “general uprising” by the South Vietnamese was now a dead issue. On 29 April the enemy opened round two of his offensive. Days or weeks before, the 320th NVA Division had managed to infiltrate from the Khe Sanh area eastward towards the headquarters of the 3d Marine Division at Dong Ha. Suddenly, the communists threatened to cut not only Highway 1 but the Cua Viet River channel, the Marines’ major supply artery in northern I Corps. In a series of battles lasting almost two weeks, the NVA gave the hard pressed Leathernecks and supporting Air Cav troops all they could handle before giving up and slipping piecemeal back across the DMZ. As had become the norm in Vietnam, the enemy had been badly bruised but not destroyed. The 320th NVA would be back, and sooner rather than later. Fighting in the Saigon area was likewise heavy, although not the large-scale "search and destroy" affairs of previous years. But the innumerable small skirmishes throughout the country were near continuous—and lethal. In the first six months of 1968, more U.S. personnel would be killed in Vietnam than in all of 1967, which had seen some of the bloodiest fighting of the war. May would prove to be the deadliest month of the entire war, when 2,169 Americans died as a result of enemy action. Other than in and around Saigon ground attacks against fixed targets were limited, but on the southern fringe of I Corps the enemy would score a major victory. The Special Forces camp at Kham Duc, situated in a remote valley a few scant kilometers northeast of the Laos-Vietnam-Cambodia border intersection, stood in the way of North Vietnamese plans to construct a high-speed branch of the Ho Chi Minh Trail to facilitate rapid movement of men and supplies into the coastal plain between Da Nang and Chu Lai—the invasion corridor envisioned in earlier enemy planning. Thin allied presence in the area had allowed two regiments of the 2d NVA Division to slip into position to attack Kham Duc and its smaller subsidiary at nearby Ngok Tavak. The battle began in earnest on 10 May as Ngok Tavak was quickly overrun. B-52s unloaded hundreds of tons of bombs on the surrounding jungle, with undetermined effect. A reinforcing battalion was hastily scraped together and flown into Kham Duc, but it was too little too late. The U.S. command, no doubt heavily influenced by the recent experience at Khe Sanh, ordered the outpost to be evacuated. The air evacuation got underway around 0800 on 12 May, with the runway under constant enemy fire. In the melee which followed, a three-man USAF Combat Control Team (CCT) was inadvertently left on the landing strip as the last C-130 departed under heavy enemy fire. With the sudden realization that they were now abandoned and likely doomed to capture or death, the CCT radioed for help and prepared to make a last stand. 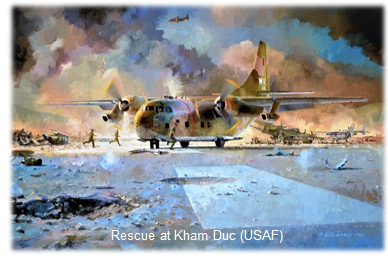 Two would-be rescue attempts aborted, but Lt. Col. Joe Jackson dove his C-123 through the hail of bullets, landed, and taxied towards their position. Firing their M-16s as they ran, the three men scrambled aboard. The unarmed transport waddled into the air, literally over the heads of NVA troops on the runway. For his actions, Lt. Col. Jackson was awarded the Medal of Honor. Beginning on 5 May and continuing for the next several days, enemy rockets and artillery rounds struck almost two hundred separate targets throughout South Vietnam. Twenty-five airfields were bombarded, including Pleiku and Tan Son Nhut, but no EC-47s were reported damaged. From February through June, Tan Son Nhut was hit by nearly 200 rocket and mortar rounds. Pleiku took another 75 rounds, but with the exception of the opening Tet onslaught there was little further damage and no front or back end casualties resulted. Nha Trang escaped the initial barrage, but on 22 May the base took seven rounds, one of which impacted directly in front of EC-47 43-49126. A “start cart” absorbed most of the blast, but the near miss knocked out both engines and their propellers. Some 250 hours of sheet metal work kept the aircraft grounded until the end of June. Through it all, EC-47 crews kept up an unrelenting pace. From April through June, for example, Nha Trang-based EC-47s were aloft for more than 6,200 hours in 881 sorties, although with an abort rate that hovered around eight percent. The tempo of enemy activity can be gauged by the number of fixes made during that period—6,134; an average of 67 per day. On 6 May, Nha Trang crews alone fixed 102 targets, an astonishing 32 of these on one mission. For the entire January-June period, Pleiku crews reported copying just shy of nineteen thousand targets, of which 13,031 were fixed; a rate of nearly seventy percent. “Cuts” were obtained on another 701 transmitters. Of the 2,047 targets identified as high priority 1,603 fixes were obtained. Combined with an additional 88 cuts, over eighty percent of the priority targets were located with varying degrees of precision. Among the notable results was a fix on the headquarters of the 325C NVA Division, recently arrived from Khe Sanh and high on the 4th Infantry Division’s watch list. More than nine hundred EC-47 sorties would be flown in support of Operation MACARTHUR, the central highlands campaign which had begun back in October and would continue into early 1969. Throughout Mini-Tet, the EC-47 units had been luckier than they perhaps had any right to be. But more ominous than enemy stand-off attacks on their bases in South Vietnam was the increasing threat now confronting the slow-moving Gooney Birds in the air over Laos. On 11 March Nha Trang-based BREW 41 was hit by a suspected 37mm AAA round while operating in the STEEL TIGER area. Some outstanding airmanship got the mortally wounded EC-47 back “across the fence” to a crash landing at an abandoned Special Forces camp. Miraculously, everyone walked away. Six weeks later, RARE 08 was also hit by 37mm but managed to make an emergency landing in Thailand. These incidents were a hint of things to come. Laos would prove to be a much more dangerous environment than Vietnam.